A no confidence motion against Minister of Megapolis and Western Development Champika Ranawaka was handed over to Speaker Karu Jayasuriya today. 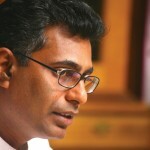 The no confidence motion containing 42 signatures of joint opposition parliamentarians cited the Minister’s alleged involvement in the recent accident in Rajagiriya which left one person critically injured, and for allegedly dodging action against him by falsifying information in relation to the incident. This is the second no confidence motion against a government minister in less than a fortnight. Last month, the opposition also handed over a no confidence against Finance Minister Ravi Karunanayake. Vote Decisively For A Credible Political Culture For Our Children’s Sake!